EOO <2200 km², known from eight locations. Much of its habitat has been lost to commercial forestry plantations, urban expansion and vineyard, orchard and buchu cultivation. Habitat loss to crop cultivation and encroachment from invasive alien acacias is ongoing, especially in the Elgin valley. Fynbos or renosterveld, on clay and granite slopes. Goldblatt, P. and Manning, J.C. 1997. 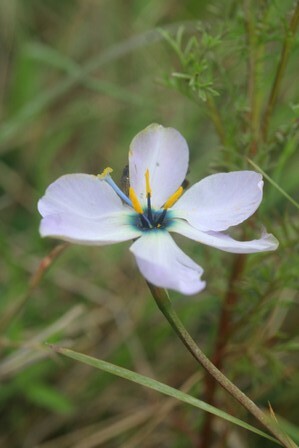 New species of Aristea (Iridaceae) from South Africa and notes on the taxonomy and pollination biology of section Pseudaristea. Novon 7(2):137-144.